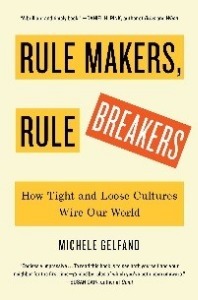 Michele Gelfand is the author of RULE MAKERS, RULE BREAKERS: How Tight and Loose Cultures Wire Our World. She is a Distinguished University Professor at the University of Maryland, College Park. Gelfand uses field, experimental, computational, and neuroscience methods to understand the evolution of culture--as well as its multilevel consequences for human groups. Her work has been cited over 20,000 times and has been featured in the Washington Post, the New York Times, the Boston Globe, National Public Radio, Voice of America, Fox News, NBC News, ABC News, The Economist, De Standard, among other outlets. She has received over 13 million dollars in research funding from the National Science Foundation, Department of Defense, and the FBI.